HONDA JAPAN has outlined the company's future plans, which include increased development of electric motorcycles, as well as bold moves to take on Japan's main competitor: China. In his 2010 mid-year speech, company President and CEO Takanobu Ito said Honda will begin lease sales of the battery-powered EV-neo two-wheeler to businesses and individual business owners in Japan later this year. Ito also said Honda will strive to improve technology and reduce costs to make zero-emission machines available to a wider audience. Honda's move towards enhancing zero-emission technology is serious. The company is in collaboration with electromotive specialists to study the possibilties of solar-powered energy stations, for plug-and-charge systems which can be used by battery-powered machines. Honda is planning to conduct testing and demonstration of the system first in Japan, hinting the United States will follow. The project is aimed at showing how plug-in hybrid vehicles can benefit our environment and daily life. 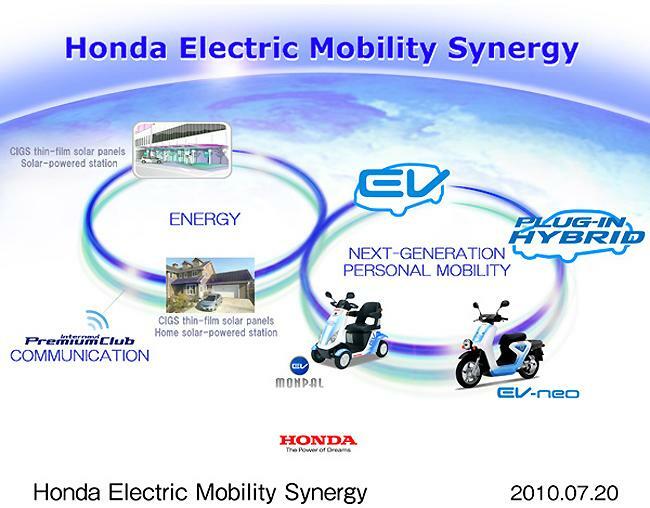 Using experimental models of electric vehicles and plug-in hybrid vehicles as well as the EV-neo electric scooter, Honda will verify the effectiveness of such personal mobility to realise low-carbon mobility. By monitoring the positional and operational information of participating Monpal ML200 electric carts, Honda will verify how such personal mobility will contribute to the quality of the daily life and health of local residents in the face of an aging society. By establishing and utilising recharging stations that use thin-film solar cells manufactured by Honda Soltec, Honda will verify the effectiveness of the system which reduces CO2 from the energy-supply phase. The company also plans to target China with electric and petrol-engined motorcycles next year, stating they will introduce a new zero-emission machine into China in 2011. Honda will also expand its annual motorcycle production capacity in Indonesia to 4 million units by building a new plant with a capacity of 500,000 units, which will become operational in the latter half of 2011. The expansion will see Honda’s annual motorcycle production capacity in Asia (excluding Japan) increase from approximately 16 million units to 18 million units by the end of 2011.